Across the Aegean, ships of legendary repute sail in search of booty, adventure, and enough rum to sink a galleon. 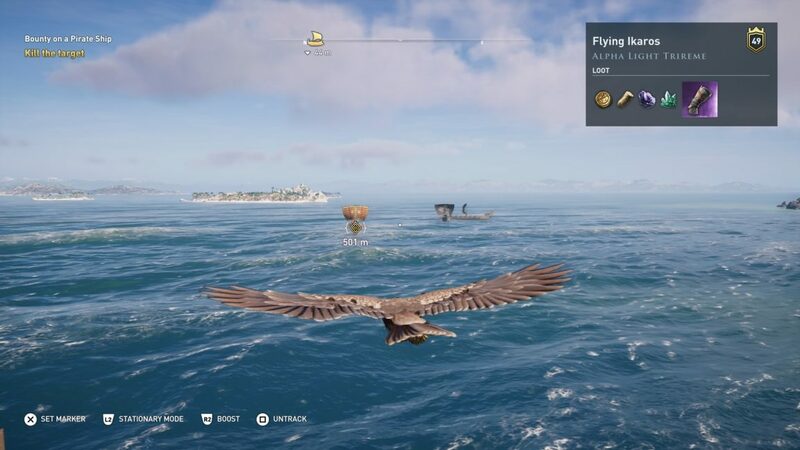 Ubisoft is adding special nautical bounties to Assassin’s Creed Odyssey after release, so we’ll keep adding to this page with the Epic Ship locations so you can track down and take out each one. 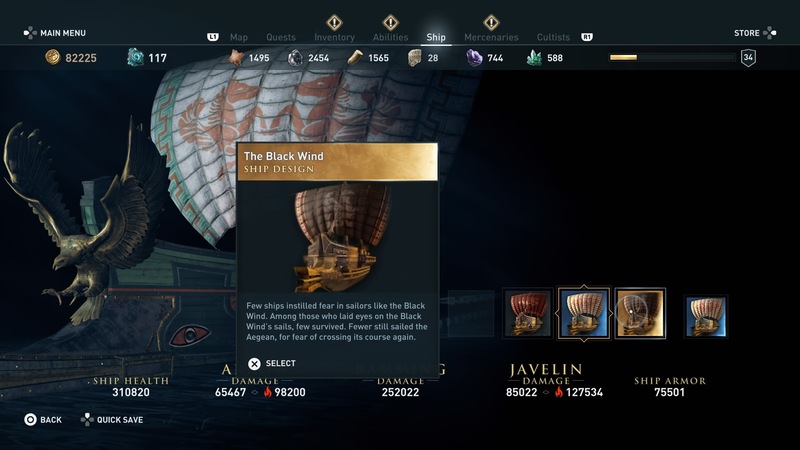 The first Epic Ship added to Assassin’s Creed Odyssey is The Black Wind. To accept the quest to find and defeat the ship, either head over to the notice board on your ship, or to one on land. 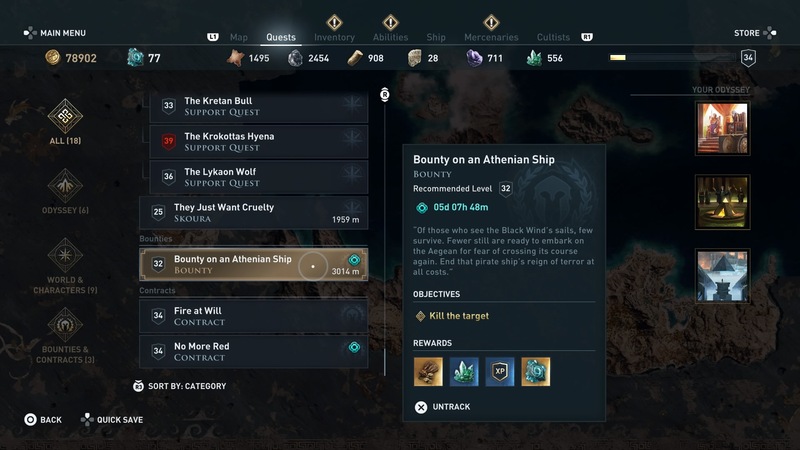 The quest should be called “Bounty on an Athenian Ship”. Ubisoft has said the bounty is available to players above level 30, so if you’re under that level and can’t find the quest, that’s probably why. To find The Black Wind you need to head to the area sandwiched between the two trios of islands in the southeast of the map. Just to the north of Thera, Anaphi, and Nisyros, and south of Paros, Naxos, and Kos you’ll find your target. There are three ships sailing under the Black Wind banner, so we’d suggest taking them out one at a time. Starting with the two that don’t have a quest marker. As you approach, watch for one of the three ships moving away from the other two and move to engage that one. By taking out one at a time, you can focus your finite volleys of arrows on one target, as well as restoring your health between scraps when you board a scuppered vessel. The Black Wind ships don’t attack you until you’re quite close, so a good way to start an attack is to ram them. This not only does hefty damage, but creates a weak point that lets you scuttle the ship more easily. Once you’ve taken out all three ships, you’ll earn The Black Wind cosmetic for your ship, as well as a sizable chunk of xp and crafting resources. The second Epic Ship to grace the waters of the Aegean is the Flying Ikaros. 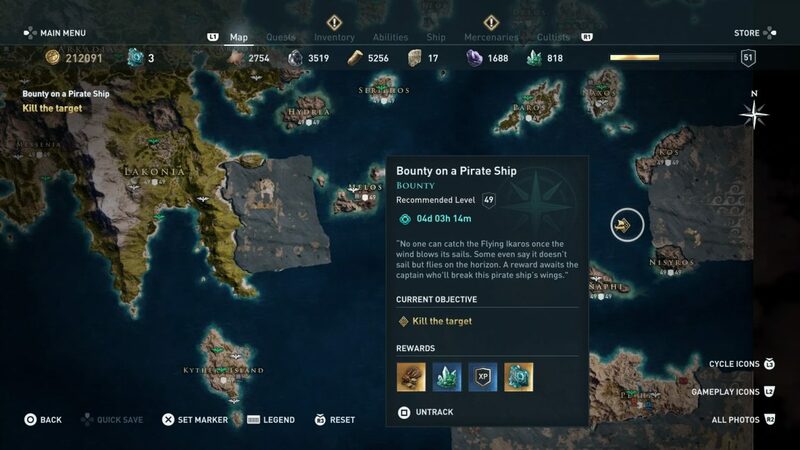 Destroying this pirate ship and its accompanying posse will net you a sackful of Drachmae, some crafting materials, XP, and precious Orichalcum Ore.
To track it down, accept its quest from any bounty board in the game. 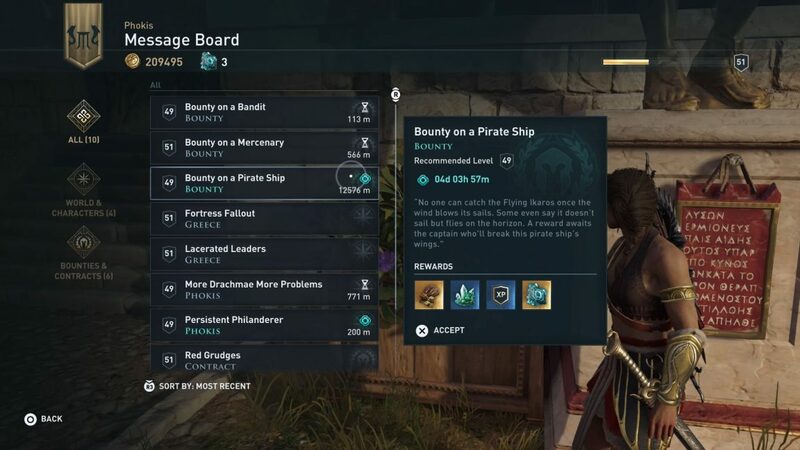 The quest should be called “Bounty on a Pirate Ship”. Once you’ve done that, head over to the east of the map near the Volcanic Islands: Thera, Anaphi, and Nisyros. North of Anaphi, you should find the ship with two others. As with The Black Wind, you can try and lure the secondary ships away from the main bounty so you’ve got a straight fight. 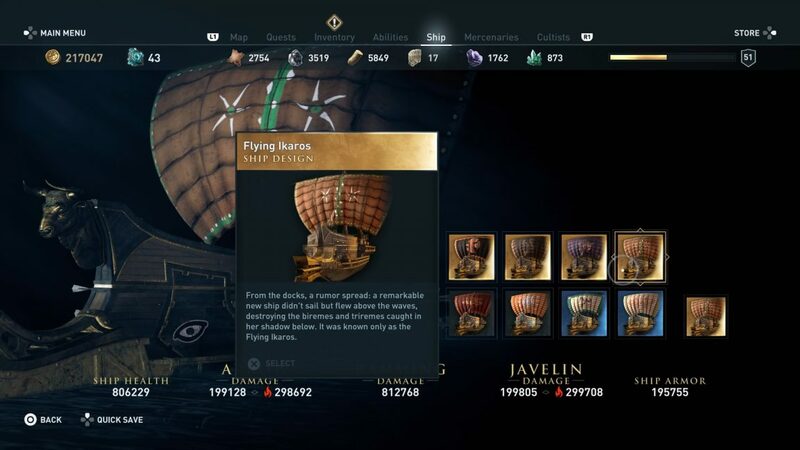 Once The Flying Ikaros is vulnerable on its own, take it out as you would any other ship – raining volleys of arrows into its hull and ramming it to deal heavy damage and create weak points. The Ikaros seems to like to use fire arrows against you, so be ready to brace as it readies up. After you’ve weakened the ship enough, you can board and take on the crew – three of which are tough elite soldiers. 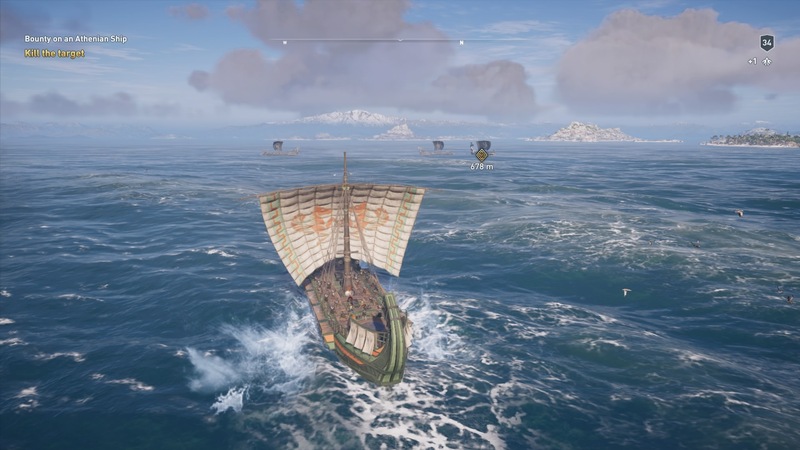 Defeating the ship nets you 40 Orichalcum Ore, as a unique ship skin. For more on what you can do with The Adrestia, specifically how to recruit the best Special Lieutenants in Assassin’s Creed Odyssey, check out our guide. If you enjoy set-piece fights, then maybe you should take a trip to Assassin’s Creed Odyssey’s Arena too.